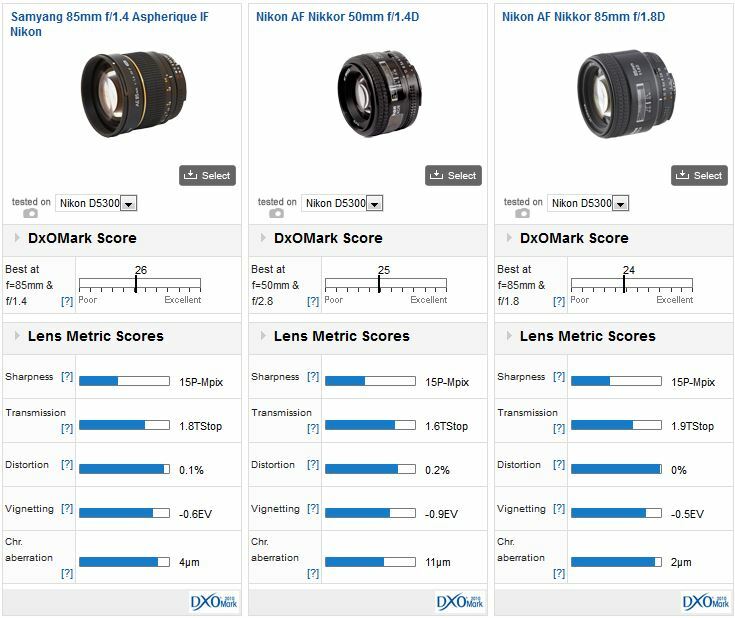 The top three performing moderate telephoto models include the Zeiss Otus 1,4/55, equivalent to a 85mm on the D5300, followed by Nikon’s two 85mm models, the AF-S Nikkor 85mm f1.8G and f1.4G. Not much separates the two 85mm (130mm equivalent) models in IQ, but it’s worth bearing in mind the 85mm f1.4 is nearly a stop faster than the f1.8 model and it yet it has the higher peak sharpness. Although in real terms it’s a small increase. Peak performance is achieved at f4 on the 85mm f1.4 and f5.6 on the f1.8 model but even then it can’t quite match the faster model’s sharpness. Peak performance is achieved at f4 on the AF-S Nikkor 85mm f1.4G model, whereas the AF-S Nikkor 85mm f1.8G must be stopped down to f5.6 and even then it can’t quite match the pricier model (though it’s very close). 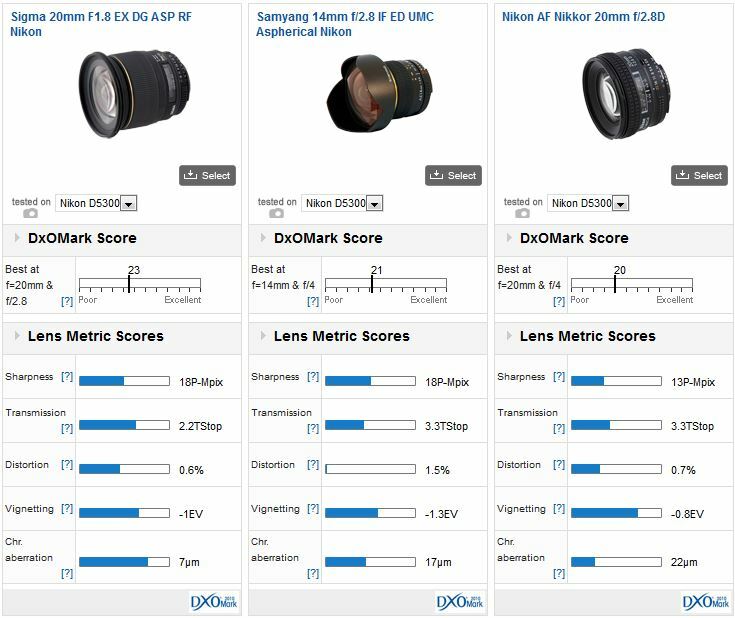 The best performing moderate telephoto on the D5300 is also the highest performing lens in the database, regardless of focal length. And at nearly $4,000, so it should be. As the equivalent of a 85mm lens on the D5300, the Otus 1,4/55 may seem well suited but keep in mind the lens is very large, about the same size as 135mm f2 or 24-70mm f2.8. It’s also incredibly sharp at the initial aperture, and it may even be just too sharp for portraits, unless your model has flawless skin. In fact, wide-open it’s just slightly sharper in the center than either the AF-S Nikkor 85mm f1.4 or the 85mm f1.8 at their optimum apertures. 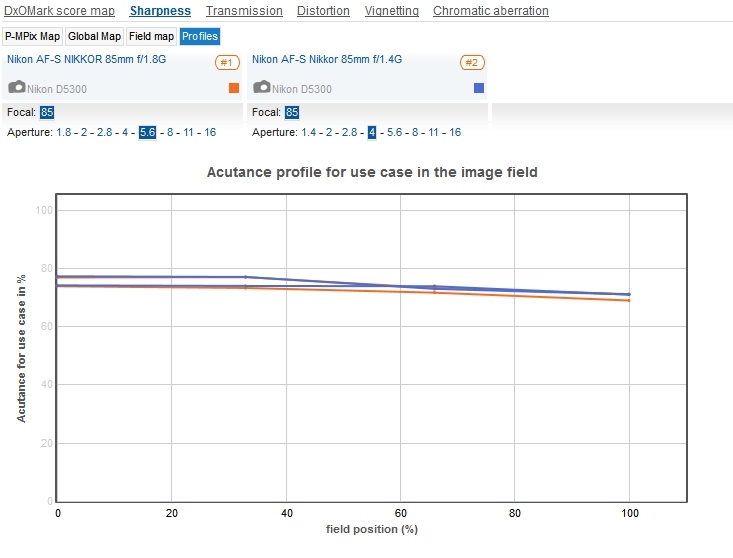 Maximal sharpness is achieved at f2.8-4, but even stopped down below that it has exceptional sharpness and uniformity. Lateral chromatic aberration is a little higher than we’ve seen previously on full-frame models although it is consistent with other APS-C camera models. More in keeping with the modest price of the camera body itself, the manual focus only Samyang 85mm f1.4 Aspherical IF is a very good performer and is available for around $330. Wide-open at f1.4 it has similar sharpness and uniformity to the far pricier Nikon AF-S Nikkor 85mm f1.4 and with the exception of some soft corners at f2 it has good sharpness across the frame throughout the aperture range. Transmission is a little lower than expected but chromatic aberration is very low indeed. Another good performer is the now discontinued Nikkor AF 85mm f1.8D – it lacks a built-in AF motor and useful real time manual override but once stopped down to f2.8 it has similar sharpness to the newer AF-S version. It can even boast lower CA and vignetting. 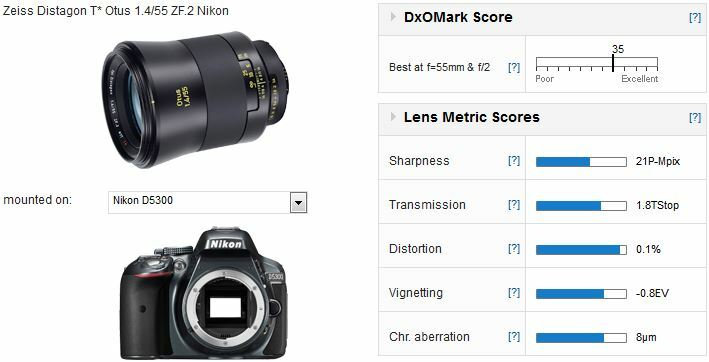 If those models are a bit ‘long’, the old AF Nikkor 50mm f1.4D could be useful. Although officially replaced by the AF-S model it can still be found on dealer’s shelves for around $330. As an AF-D model it lacks the built-in AF actuator of the newer version but it’s good performer optically, particularly from f4 onwards. The best performing wide-angle prime is the manual focus Zeiss Distagon T* 2/25 (25mm f2) ZF.2, which very narrowly improves on Nikon’s own highly regarded AF-S Nikkor 24mm f1.4G ED. Both lenses are extraordinary performers, but keep in mind the Nikkor is a stop faster. In third place is the high-speed Sigma 20mm (31mm equivalent) f1.8 EX DG Aspherical RF. It’s not quite so well corrected as the Zeiss and Nikkor 24/25mm lenses but it has very high sharpness and is priced quite modestly (around $629) given the maximum aperture. The best performing wide-angle on the Nikon D5300 is the manual focus Zeiss 2/25 (25mm f2) though as the equivalent to a 35mm it’s really only moderately wide, and quite an expensive option. Nevertheless, it’s a superb performer optically with very low chromatic aberration and excellent sharpness from the initial aperture. Uniformity and chromatic aberration are also impressive wide-open Corner sharpness dips a little on stopping down, but improves again at 5.6 making it a good choice for low-light photography (at f2.0 especially). Slight barrel distortion is noticeable and vignetting doesn’t clear till f4 but the high image quality and rugged build is compelling. In third place is the more modestly priced Sigma 20mm (31mm equivalent) f1.8 EX DG Aspherical RF. With a DxOMark score of 23 points and high peak sharpness (measured at 18P-Mpix) the Sigma is a very good performer optically from f2.8 onwards at least, but it’s quite a large lens and weighs in at fairly substantial 1.14 lb (520g). If the focal length appeals, the film era AF Nikkor 20mm f2.8D is a good deal smaller and lighter 9.52 oz (270g), but keep in mind it’s a stop slower and it doesn’t quite have the sharpness or uniformity of the Sigma when stopped down. It also has fairly high levels of lateral chromatic aberration. Although it seems a little bizarre to use something as extreme as a 14mm on APS-C Samyang’s 14mm f2.8 is quite compact and at $409 is relatively inexpensive. It’s a good performer as well, with high sharpness from f4 onwards though it has quite high levels of distortion and chromatic aberration as you might expect from an full-frame ultra-wide like this. While there are plenty of wide-angle primes that can be put to good use on an APS-C body like the D5300, Nikon users can take comfort in the knowledge that there’s always the option of the AF-S Nikkor 14-24mm f2.8G ED zoom instead. At $2,000 it may sound expensive but this lens can replace four focal lengths (and everything in between) and still offer a fast f2.8 maximum aperture. It’s also good performer. 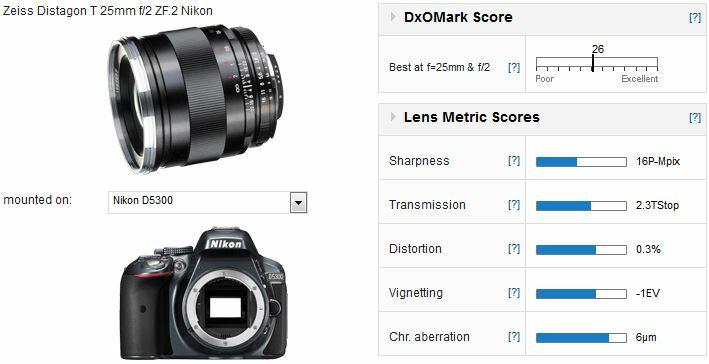 In fact it heads our rankings with a DxOMark score of 20 points and a very good 15P-Mpix peak sharpness rating. 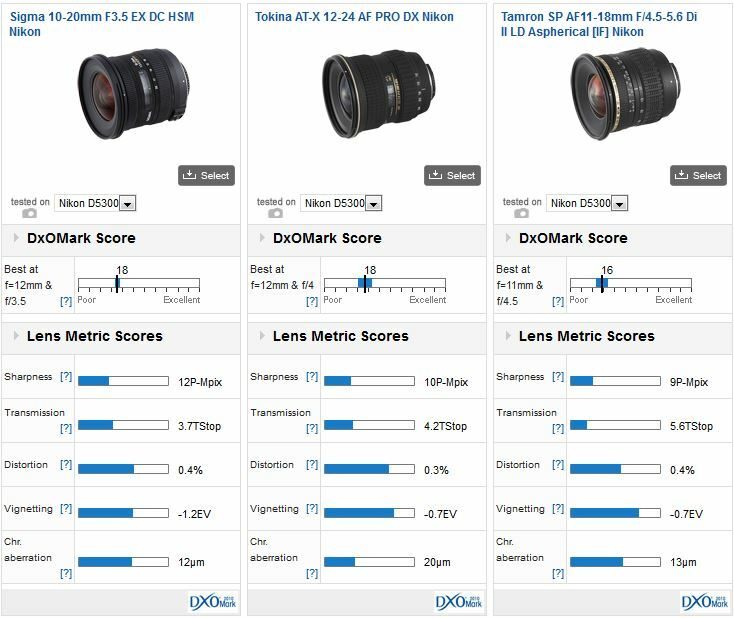 In second and third place in our rankings is the ultra-wide Tokina AT-X 116 (11-16mm f2.8) PRO DX and its brand new replacement the, 116 PRO DX II. Although as APS-C only models they can’t achieve the image quality or sharpness of the Nikkor zoom, they come quite close for around a third of the price. One of the most highly regarded lenses of recent times, the full frame AF-S Nikkor 14-24mm (21-37mm) f2.8G ED is the best wide-angle zoom in our database. 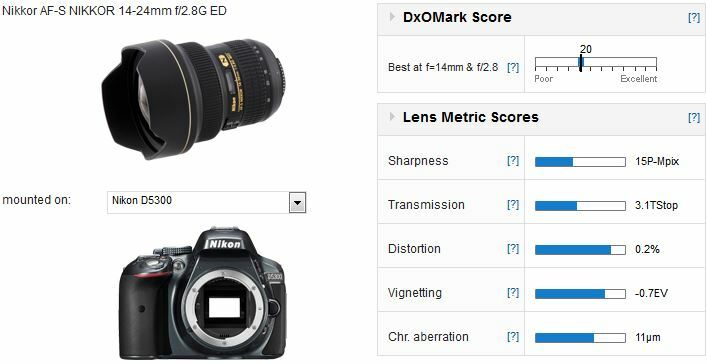 With a DxOMark score of 20 points it ranks alongside many of the wide-angle primes and even out-performs a good many, such as Nikon’s own $1,800 AF Nikkor 14mm f2.8D. It is a remarkable performer at 14mm with very good center sharpness wide-open though it tails off towards the longer end. However, stopped down to f4 sharpness is very good at every focal length and that continues to f11 where diffraction effects start to become noticeable. Lateral chromatic aberration; usually an issue in a high-speed ultra-wide like this is surprisingly well controlled and the same can be said for vignetting, in fact the latter is less in the 14-24mm f2.8 than equivalent primes. Although the two Tokina ATX 116 PRO models qualify as a value option, the wider range Sigma 10-20mm f3.5 EX DC HSM is close in image quality and price, at around $650. In fact, wide-open the Sigma is sharper than the Tokina particularly at the longer end, though once stopped down to f5.6 they’re very similar. At $400, the now discontinued Tokina AT-X 124 (12-24mm f2.8) AF DX is another good value option, if it still can be found. Like a lot zooms it’s sharper at the shorter end of the range but it has quite high levels of chromatic aberration. The Tamron SP AF 11-18mm f4.5-5.6 Di II LD Aspherical could also be a contender. It’s around $150 less than the Sigma though keep in mind it has a slower variable maximum aperture, slightly lower sharpness and no sonic type AF actuator. 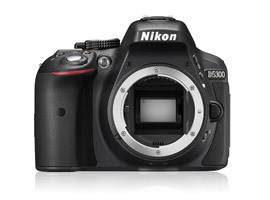 If you have a new Nikon D5300 and a favorite lens, we would very much like to hear from you. Please leave a comment below, stating what lens it is and why you like it.